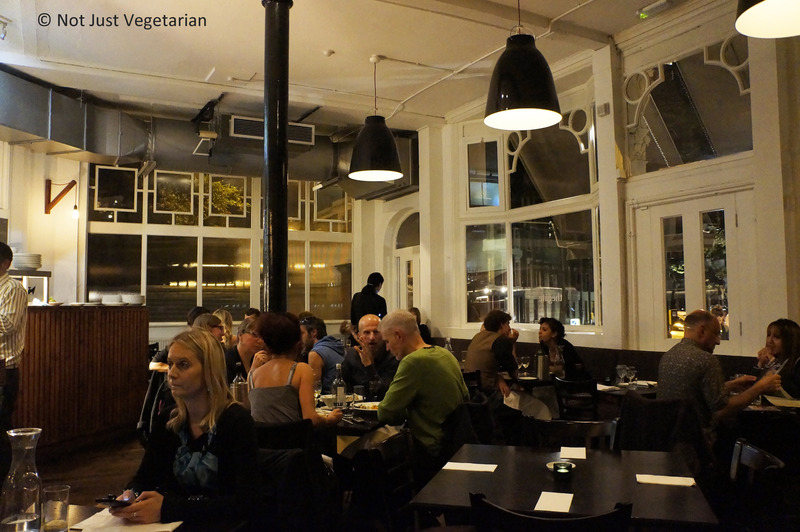 The Gate restaurant was highly recommended to me as the “best” vegetarian restaurant in London before I moved to London. So, I had to check it out! 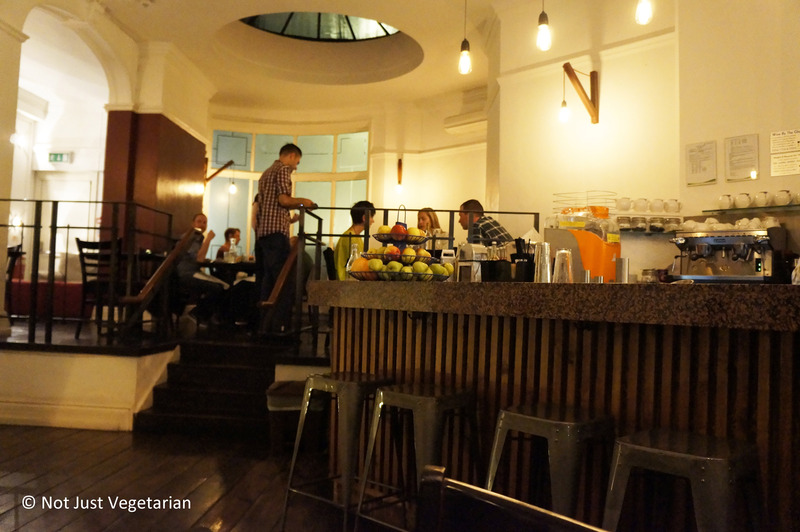 I loved the airy, casual “feel” of The Gate in Islington and the range of vegetarian options there. 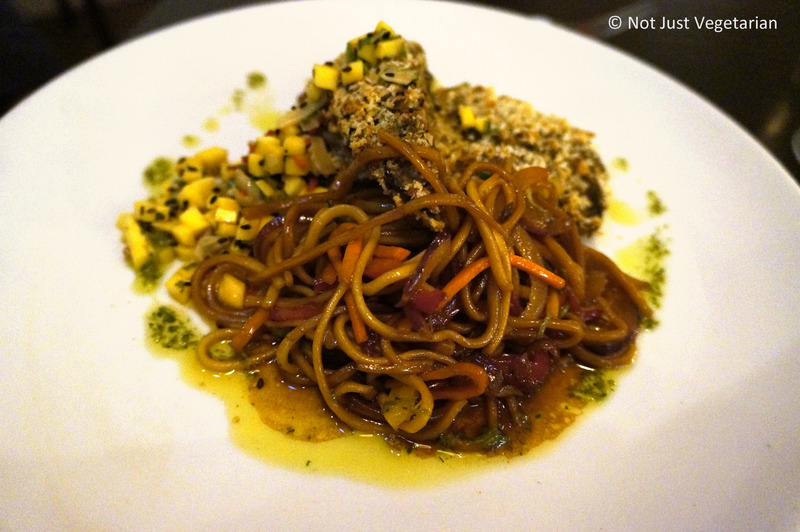 Some dishes can be made vegan upon request, some are naturally gluten-free and can be made / served gluten-free as well. The wine list offers a number of wines by the glass, carafe and bottle that are labeled vegan, organic, bio-dynamic etc. Chefs / Owners Adrian and Michael Daniel have created a number of dishes that draw upon their Indo-Iraqi and Jewish background and with French and Italian influences as well. 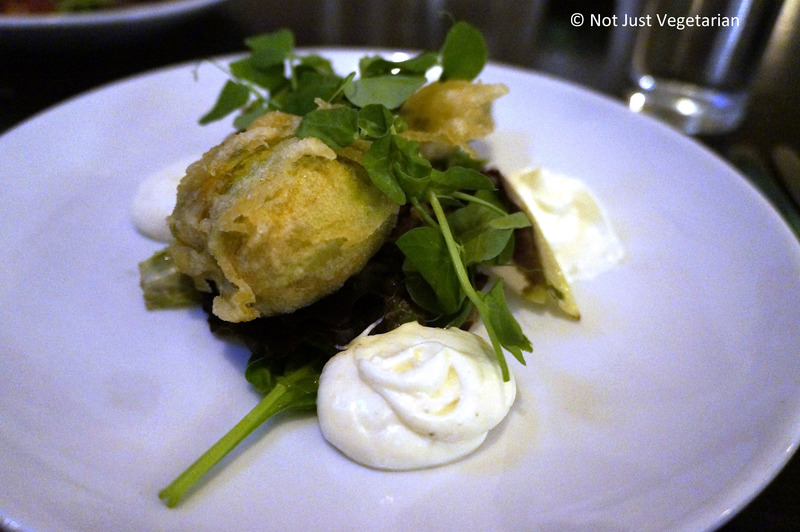 The courgette flower was the best dish that we ate that night! The stuffing of feta and mint with pine nuts and the lemon aioli brought a certain mediterranean lightness to this dish! Must order this dish if you eat at The Gate Islington. The Involtini’s highlight was the apple-smoked cheddar. Meat lovers who miss meat will love the smoked cheddar in this dish!! 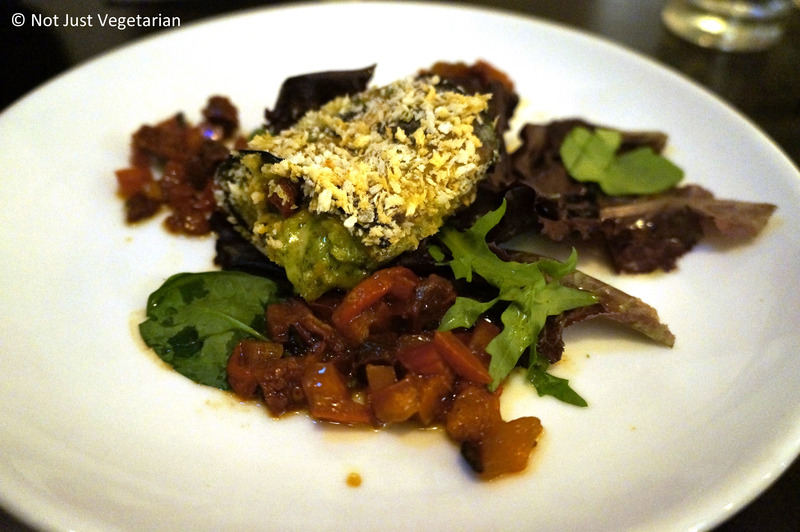 The coriander pesto and the salsa rosso paired well together in this dish. 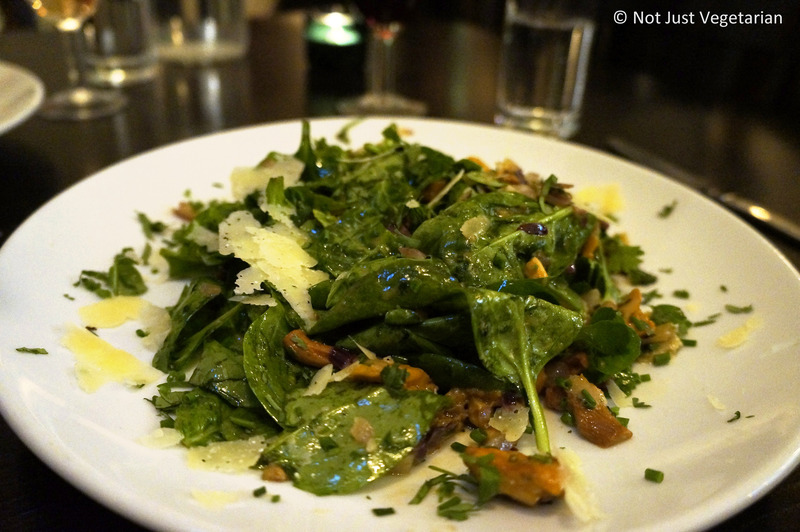 I liked the woodland salad for its combination of ingredients – hazelnuts, rocket, parmesan (vegetarian – Twineham grange) I wanted to love the woodland salad, but the truffle oil overwhelmed this dish not just with its flavor (and I do love truffle oil). If the truffle oil had been used sparingly, I would have loved this dish. It looks very pretty, don’t you think? My friend loved the aurbergine teriyaki with the ginger-mango salsa, although I did not. The dish sounds better than it tasted, or so I thought! There was something missing in this dish – may be salt, may be soy sauce. For people with dietary restrictions and stricter vegetarian / vegan preferences (than I have), Gate Islington is a great restaurant. 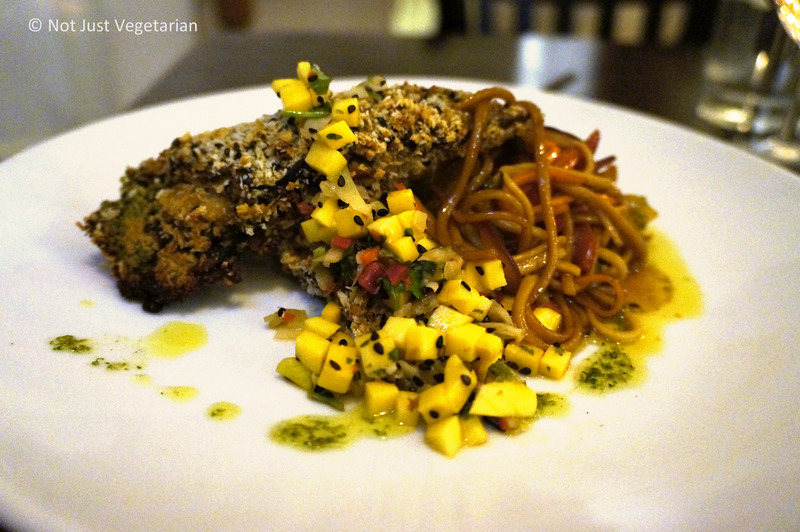 The visit to Gate in Islington was certainly worth it, but I was not “wowed” by it. Some amazing NYC restaurants that serve vegetarian, vegan and gluten-free food are Table Verte, Cafe Blossom, and Peacefood Cafe.